The best way to get XAMPP portable is not necessarily the shortest. That is because there is a very useful tool out there which you might want to consider. 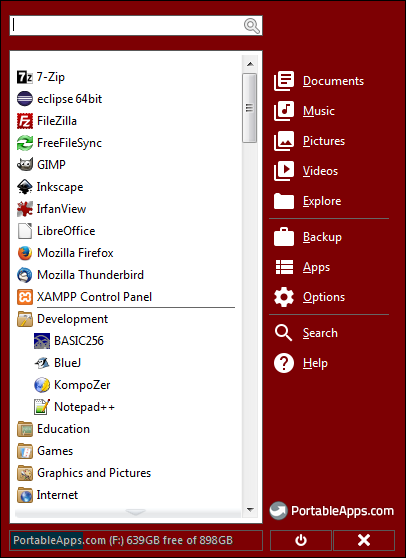 Portableapps.com is a free package which lets you run applications on an external drive under Windows. That means that you can not only have your server on the external drive but your editor, most common browsers and other software as well. Then you can develop pages (and do other stuff) wherever you are and whatever Windows computer you are running on. You can take your work and your settings with you. Another advantage is that you can normally install these applications even on a networked computer where you do not have permissions to install normal programs. You might want to now look through the other apps available under PortableApps.com. They will be much easier to install. They are also listed on their site. At least add Notepad++ and maybe some other Web editors to try. Irfanview is good for quickly cropping and resizing images although it is a little weird. GIMP is good for more advanced graphics but again takes some learning. Filezilla is a good and simple FTP program for getting pages to proper servers (not needed for XAMPP). Now would also be a good time to get some extra browsers to test your pages in and an antivirus program just in case.